Mission: The mission of the Conserve Florida Water Clearinghouse is to develop collaborative relationships with related programs, and to collect, analyze, and make available reliable information and technical assistance to public water supply utilities and water managers for use in developing effective and efficient water conservation programs. Funding for the Conserve Florida Clearinghouse and the EZ Guide Online application from FDEP and associated sources was discontinued as of June 30, 2014. Public availability of the existing EZ Guide Online application has been discontinued as of that date. 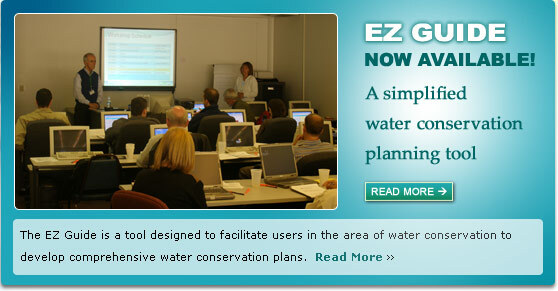 Any interest in using the EZ Guide Online should be directed to the Florida Department of Environmental Protection. It is anticipated that continued development and support of the EZ Guide application and methodology will occur through the University of Florida and other entities. Inquiries regarding the EZ Guide Online application should be directed to the contacts below. Texas marked a milestone in water stewardship and conservation policy as Gov. Rick Perry signed House Bill 4, which lays the foundation for meeting Texas' water future. HB 4 provides for active, full-time governance at the Texas Water Development Board; creates a new funding mechanism to support water-supply project implementation over the next 50 years; and directs local, regional and state officials to prioritize projects to ensure efficient use of available resources. The bill earmarks 20% for conservation and reuse projects for municipal and agricultural water use. It is the largest dedicated conservation and reuse project funding in any state to date. Texas voters will be asked to approve in November moving $2 billion in money from the rainy day fund to invest in these water projects.